Once males leave the nest they do not go back, so they have to find somewhere to spend the night. Hanging underneath the heads of flowers or even getting right into them is what they normally do. 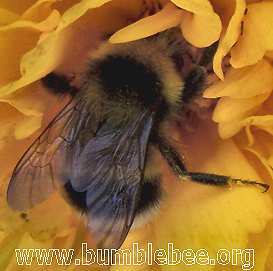 above you can see a photograph of a Bombus hortorum male deep inside a flower. 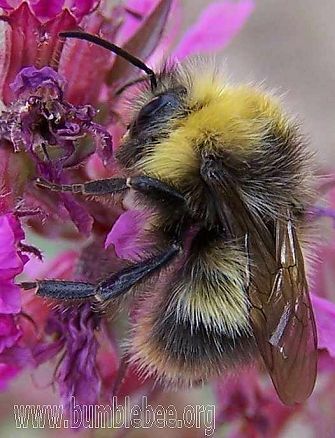 The photograph was taken in the morning before the sun had warmed up the garden and the bee could barely move. 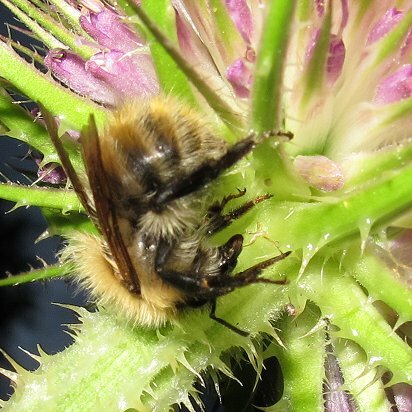 Below is male hanging underneath the head of a teasel. Their temperature will drop and by morning they will have used up their stores of energy, so until they warm up by either drinking nectar or sitting in the sun or both, they will appear listless, sick, and are unable to fly. I get a huge number of emails from people asking me why their bees are sick, when in fact they are just males who have spent the day chasing queens and drinking nectar and then stayed out all night. Sometimes it rains and they get soaking wet, but they will recover once they drink or get warmed up by the sun. Sleeping inside a disk or bowl shaped flower is a good strategy for these bumblebees and other insects as research has shown that the temperature at the base of the bowl, near the source of nectar, can be as much as 10 °C higher than the surrounding air temperature (see the bumblebees inside the courgette flower on the behaviour 2 page). Below is a Bombus pratorum male who spent the night hanging on to a spike of flowers. Look at his hind leg, the tibia is convex as opposed to the concave tibia that forms the female pollen baskets. All bumblebee males patrol mating circuits laying down a pheromone to attract new queens. The pheromone is used to scent-mark prominent objects (tree trunks, rocks, posts, etc) on the circuit. The circuit is marked in the morning, and after rain. The scent of some species can be detected by some humans. Usually they patrol at species specific heights. Bombus lapidarius, terrestris and lucorum males patrol at tree-top height. Bombus sylvestris and hortorum within 1 m of the ground. However this depends on the habitat.